Parts of the movement of Transcendentalism align with Bruce Lee’s philosophies. 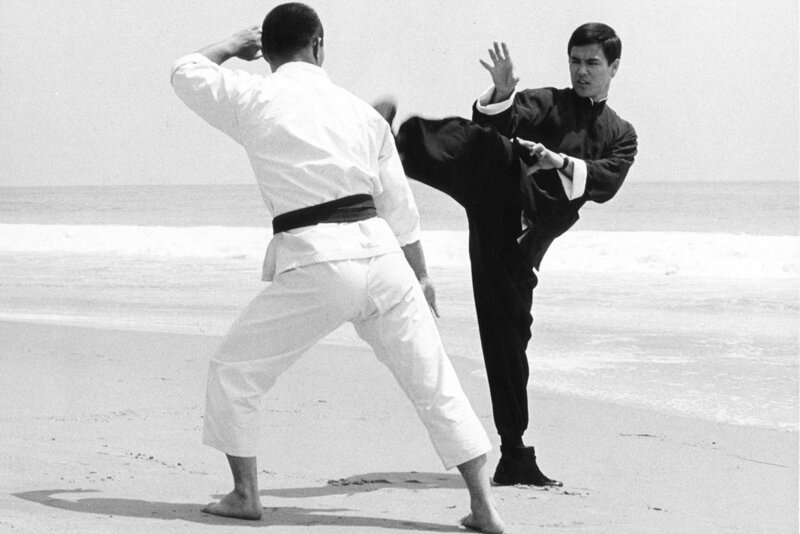 In martial arts, Bruce rejected reliance on institutions and wanted everyone to create their own style. The focus on the individual, pursuing your own path, and being one with nature are all a part of Bruce’s philosophy. Transcendence is a useful daily tool for our lives. Transcendence is about seeing the “big picture.” It is a change in perspective where you can take in the whole of the situation to better move through what you are struggling with. Seeing through an illusion can be difficult because it is hard to give up your position in a fight with another person. It takes practice to be able to zoom out and see the big picture when you are in the midst of conflict. Sometimes in order to justify our thinking we have to make the other person “wrong.” We set up our thinking in ways that only show the other person as being wrong so that we can be right. This can keep us in anger and held in a state of confrontation and combat. This way of thinking does not rise above and it does not heal. Instead of fixating on the words or the blame, pull back and let go to take in the full picture and see your part in the situation. Transcendence is a practice, and it can be difficult, but it is also extremely healing. Another way to transcend when you are in an “I’m right and you’re wrong,” conflict is to try to see how both of you could be right or both of you could be wrong. This thought practice will give you some headspace to help transcend the conflict. If you want to have a sense of full awareness, you have to include everything, not just your side. At the Bruce Lee Family Company, when we are looking for partners and collaborators, we want our collaborative work to result in “1+1=11.” This means that when we come together with a partner we make something BIGGER, our work is not just additive it is transcendent. This type of transcendental relationship makes collaboration and working together more fun and produces better solutions. When you’re confronted with a difficult challenge, it can be easy to shut down, ignore it, or avoid it. But if you shift your energy towards embracing the challenge, whether you succeed or fail, ultimately you transcend the challenge and move beyond it instead of remaining stuck. There is always something happening around you, the waters are always in motion, but the goal is to remain serene, still, and secure in your root. In order to transcend, you have to pull back and see the big picture. You have to feel the feelings in your body. Part of allowing yourself to feel your feelings, even grief and sadness, is that once you have allowed yourself to feel then you can return to a calm stillness and begin to transcend. Feel your feelings, but do not hold onto them and get stuck. Once you have felt your feelings you can release them instead of allowing them to create blockages. The sticky feeling is the fear you feel where you want to shut out everything, lock the door, and hunker down. The sticky mind is denial, refusing to examine something closely. When you are in a conflict with someone, ask yourself afterwards, “What if what this person is saying is true? How could it be possible?” Argue from the other person’s point of view. Let your mind consider it. Even if it turns out that what the other person is claiming is not true, this exercise allows you to have compassion and understanding for them because you can see their perspective. It is hard to transcend if you are not willing to consider a bigger picture or unwilling to examine yourself. Take Action: Transcendence is a daily practice. Practice zooming out and looking at the big picture in low-risk situations and it will become easier to transcend in more difficult conflicts. If you find that your thoughts are becoming entrenched in one side of a situation, interrupt your thought pattern by trying to look at the whole situation.